Were you ever late for work because you couldn’t move your car out of the garage due to garage door malfunctioning? Do you fear this might happen to you one day? A large system like that requires regular maintenance and repairs. There is a greater chance that the garage door springs would be the ones to get damaged first, and there is a very good reason for that. The reasons may vary. Springs may break due to frequent usage, for example. We’ve often seen cases where garage door springs broke only a year or two after being installed, the reasons for that is the purchase of cheap parts from untrusted manufacturers. To reduce the risk, you should only buy parts from a trusted company with high reputation and always let professionals install them. You should never attempt to replace the garage door springs on your own as they pose a threat and may cause injury to an unskilled person. It is always better to be safe than sorry. Don’t wait for it to break if you notice the opener is having trouble with lifting the door or if the balance of the door has been disturbed. 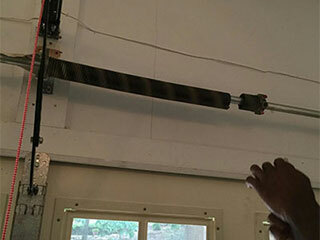 The services our company offers include the replacement of garage door springs. But that’s not the only thing we can do for you. Any part that can be replaced or repaired falls under our expertise, and if you’d like a completely new garage door, we’ve got that area covered too. Regular, annual inspections and maintenance are something you should do to prolong the life of all parts of your door and to prevent unexpected crashes. We cover all locations in the area and we can handle the problem the same day we arrive at your home. Call us and let our team or professional, expert technicians take care of the problem for you. High quality, fast service, and experienced technicians are benefits you will enjoy if you hire our company. Call today to make an appointment!